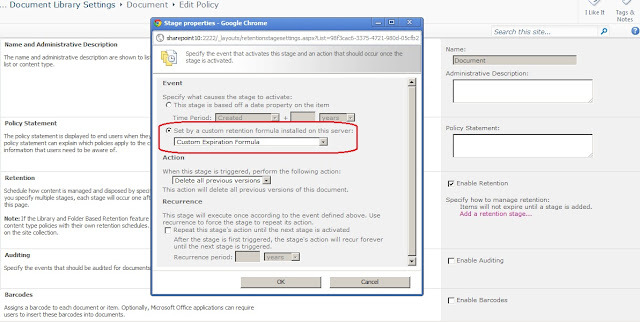 Sometimes we have a requirement where we need to enable Retention policy on document library. It provided by the SharePoint. We need to go to Library Setting -> Information management policy settings -> Enable Retention Policy and set the Retention Stage for expiration. Now if client have some custom formula for expiring the document then SharePoint proivde this function also but to achieve this functionality we need to deploy custom expiration formula on the server. Below is the code and steps to deploy Custom Expiration formula on the server. 1. Create new SharePoint Project and add reference of "Microsoft.Office.Policy.dll" from "C:\Program Files\Common Files\Microsoft Shared\Web Server Extensions\14\ISAPI"